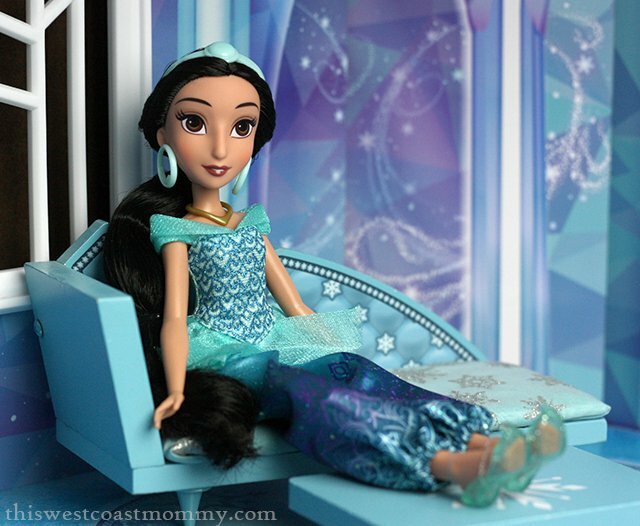 Meet Hasbro’s Disney Princess Royal Shimmer Jasmine Doll! 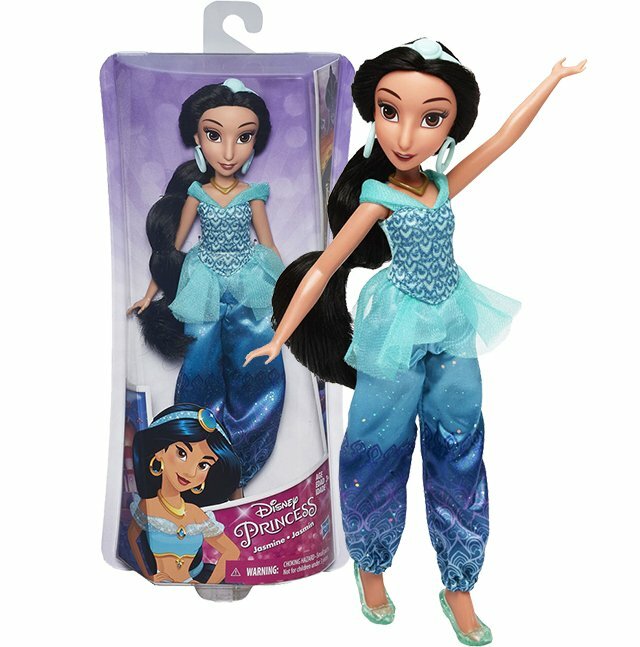 Of all the Disney Princess dolls we’ve reviewed so far, Jasmine’s face mould bears the closest resemblance to her movie counterpart with her large brown eyes, long black hair, warm skin tone, high cheek bones, and long classic nose. She wears removable earrings, tiara, and necklace, a glittery one piece outfit with aqua top and harem pants, and translucent blue shoes with cute little upturned tips. Jasmine is already fitting in with our other dolls. 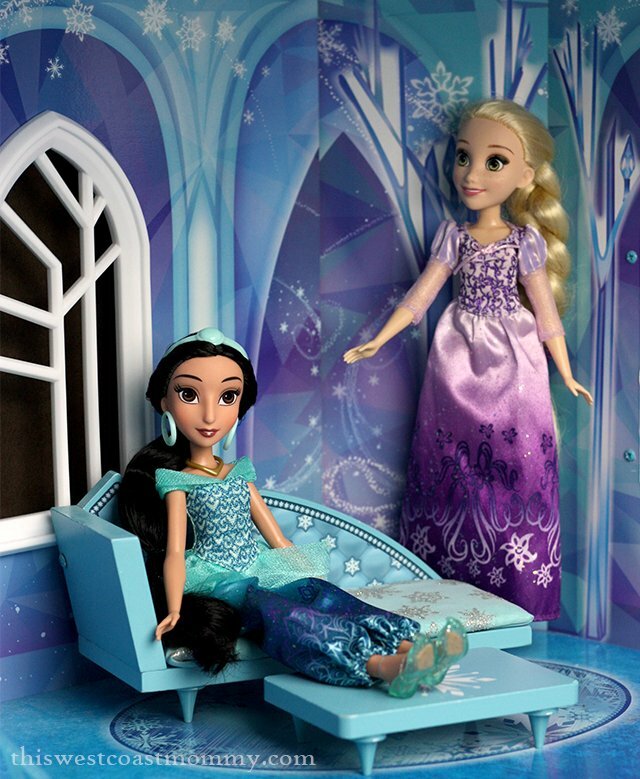 She likes to relax on the chaise lounge when she visits with Rapunzel at Queen Elsa’s castle. We also received this Disney Princess Little Kingdom Jasmine’s Golden Vanity Set. Like other Little Kingdom dolls, the doll is about 3″ tall. The vanity and ottoman set comes with two animal friends – everyone’s favourite monkey, Abu, and a white bird on a golden stand – along with a cardboard background, three paper decorations, three snap-ins, and a lamp. 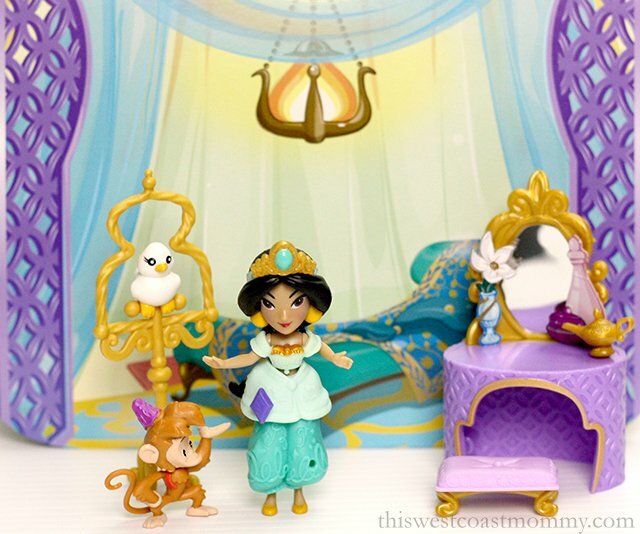 Jasmine’s outfit is made up of three pieces (bodice, peplum, and skirt) and can be mixed and matched between all the other Little Kingdom dolls. The whole thing comes in a little case perfect for keeping all the tiny pieces in one place. My girls love playing with their Little Kingdom dolls, but as I’ve mentioned in previous reviews, those snap-ins are really small and likely to get lost over time. Just accept it. On this doll, the tiara seems to fit fairly firmly, so I’m hopeful my girls can keep track of it for a while. But where will all the Disney Princesses live? Right here in the brand new Disney Princess Royal Dreams Castle! 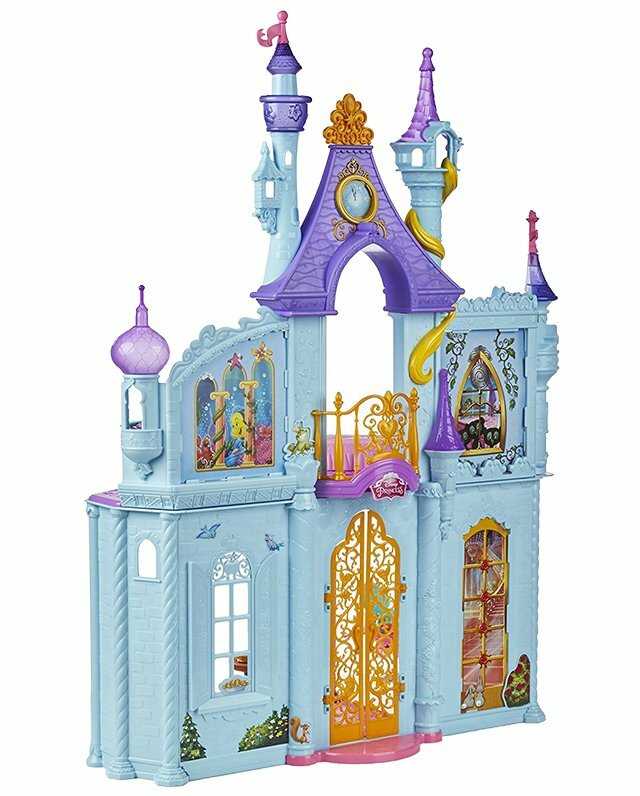 Any little girl would be ecstatic to find this magical castle under the tree this Christmas! 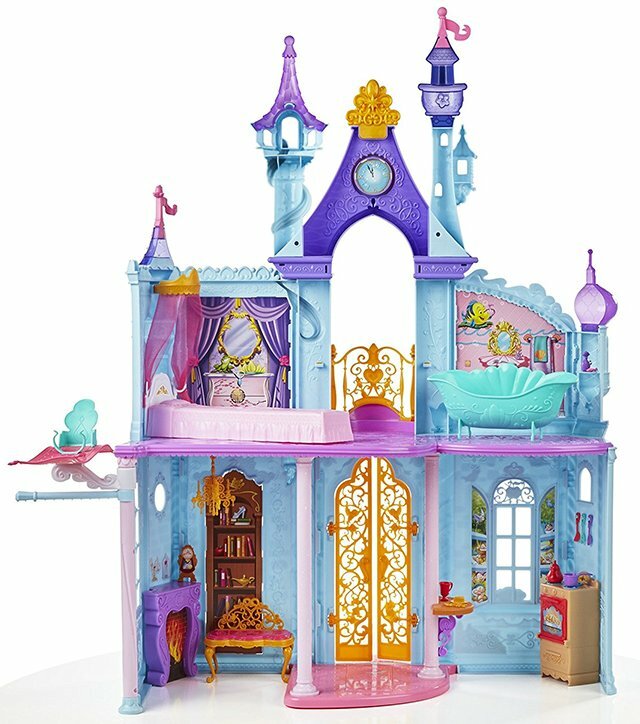 At over three feet tall, it has four rooms and comes with a bed, bathtub, bench, stove, 15 small accessories, and a magic carpet elevator ride for Jasmine that your child can manually move up and down one of the pillars. There’s room for several 12″ dolls and the castle has different areas and details inspired by each Disney Princess. The bedroom has Sleeping Beauty’s bed, a cherry blossom chest of drawers for Mulan, and a friendly frog for Tiana. There’s a bathtub for Ariel to splash around in, a library nook for Belle, a cozy kitchen for Snow White, that magic carpet for Jasmine, and Rapunzel’s tower up top. Merida’s three little brother bears are peeking through an upstairs window. Can you find Cinderella’s glass slippers? Be sure to set aside enough time to put this castle together and put all the decals on before Christmas morning. It should take around 45 minutes (or one Grey’s Anatomy rerun if you’re me right now). 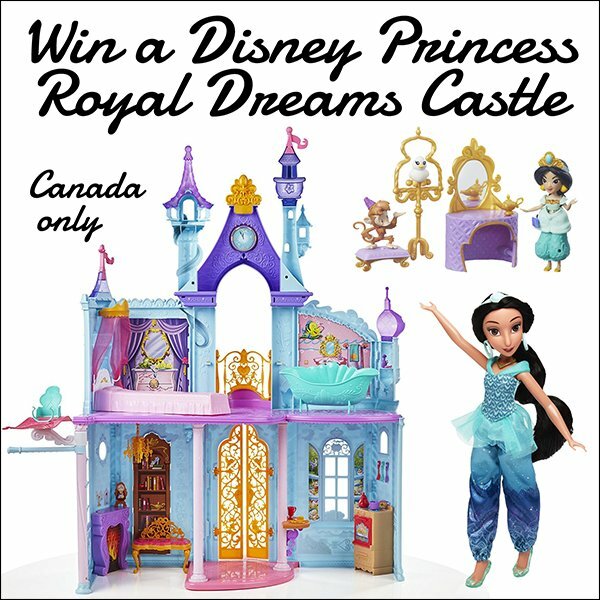 Win a Royal Dreams Castle and Jasmine Dolls! One of my Canadian readers will win a Disney Princess Royal Dreams Castle, Jasmine doll, and Little Kingdom Jasmine’s Golden Vanity Set. Enter in the giveaway widget below. This giveaway is open to residents of Canada, 18+. All entries will be verified. Prize delivery is not guaranteed by Christmas, so please plan accordingly. New From Disney Home Entertainment: Aladdin Diamond Edition & Tomorrowland Out on Blu-ray! My daughters fave is Elsa and mine is Ariel. My fav is Cinderella, my youngest was Belle, my oldest was Aerial. My favourite is Belle, and her favourite is Ariel. My favorite is Cinderella but my cousins (who would be getting this) is Jasmine. My daughter loves Belle ! My little one grew up when Elsa and Anna were popular so every time you ask about her favourites she will always answer the Princess sisters. We love Rapunzel. She*s fiesty. My favorite Disney Princess is Ariel! I’ve always wanted to be a mermaid. My kids aren’t really old enough to have a favorite yet. My favorite is Belle and my nieces is Elsa. My daughter’s favourite princess is Cinderella… and it’s not even close, she really really loves her. My niece loves Rapunzel or Elsa. My daughter’s favourite princess is Cinderella. My daughter’s favourite is Mulan (although she isn’t a princess), with Elsa coming in at a close second! My favorite is Ariel from The Little Mermaid. My goodness, these are cute. Disney is magical. Cinderella is my favourite princess. If I asked right this second, she would probably say Belle, but her favorite is constantly changing. I have a niece who love Elsa. Cinderella is my favourite. My daughter’s favourite princess is Elsa, and I love Merida! My daughter doesn’t have any preferences yet, but I love Ariel. I love Cinderella. This is a little rich girl who was treated very badly. Thanks to a fairy Godmother, she ended up marrying a prince. Our little girls favorite right now is Elsa. She does like them all though. My daughter’s favourite princess is Mulan. I have always loved Cinderella but my girls are big fans of Belle. My granddaughter favourite is Elsa from Frozen! My favourite princess is Belle. My daughter loves Rapunzel. She dressed up for Halloween as her a few years ago and has the doll from her trip to Disneyland. I really liked the movie too! My favorite is Belle and my niece likes Ariel. I’ve always love Aurora from Sleeping Beauty. My niece Harlow likes beautiful Jasmine.